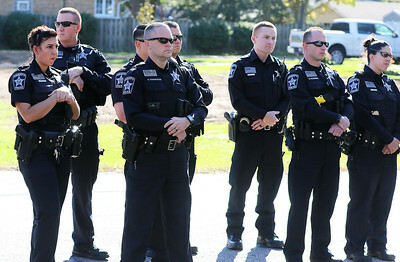 H. Rick Bamman - hbamman@shawmedia.com McHenry County Sheriff's Deputies attend a plaque dedication honoring Dwight Maness Monday, Oct. 16 at the Holiday Hills police department. Maness and his partner, Deputy Khalia Satkiewicz, were shot during a domestic incident at the Holiday Hills home of Scott B. Peters, who fired more than a dozen rounds at the two officers. Maness died suddenly during a physical therapy appointment on Sept. 14, 2015 at the age of 47. 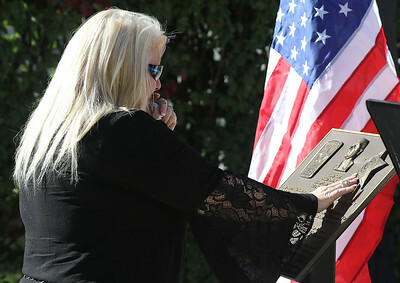 H. Rick Bamman - hbamman@shawmedia.com Sue Maness reads a plaque honoring her late husband McHenry County Sheriff's Deputy Dwight Maness after a dedication ceremony on Monday, Oct. 16 at the Holiday Hills police department. Maness and his partner, Deputy Khalia Satkiewicz, were shot during a domestic incident at the Holiday Hills home of Scott B. Peters, who fired more than a dozen rounds at the two officers. Maness died suddenly during a physical therapy appointment on Sept. 14, 2015 at the age of 47. 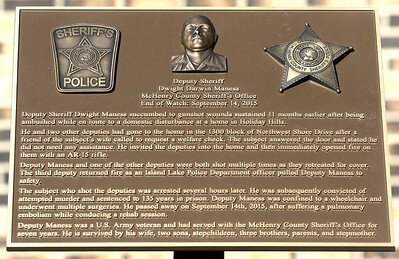 H. Rick Bamman - hbamman@shawmedia.com A plaque honoring McHenry County Sheriff's Deputy Dwight Maness was dedicated Monday, Oct. 16 at the Holiday Hills police department. Maness and his partner, Deputy Khalia Satkiewicz, were shot during a domestic incident at the Holiday Hills home of Scott B. Peters, who fired more than a dozen rounds at the two officers. Maness died suddenly during a physical therapy appointment on Sept. 14, 2015 at the age of 47. 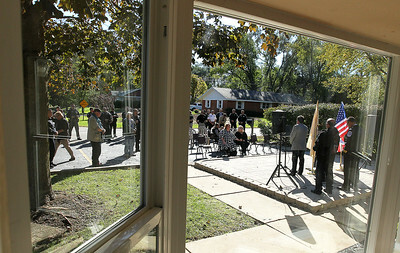 H. Rick Bamman - hbamman@shawmedia.com Holiday Hills village president Louis E. French addresses the crowd during a plaque dedication honoring McHenry County Sheriff's Deputy Dwight Maness on Monday, Oct. 16 in Holiday Hills. Maness and his partner, Deputy Khalia Satkiewicz, were shot during a domestic incident at the Holiday Hills home of Scott B. Peters, who fired more than a dozen rounds at the two officers. Maness died suddenly during a physical therapy appointment on Sept. 14, 2015 at the age of 47.